Hello, I'm Greg Houser, director of research at FEG. Every year we craft our assessment of investment opportunities and risks that we see in the upcoming years for our clients’ use. We highlight the market themes from Fed policy and trade wars to recession risks and the asset implications for our clients today. We have for you our co-CIOs, Greg Dowling, head of research and Alan Lenahan, our head of OCIO. Alan will kick us off with the key market themes and risks. Alan. Thank you, Greg. I'll start with the big picture macro inputs into our outlook. 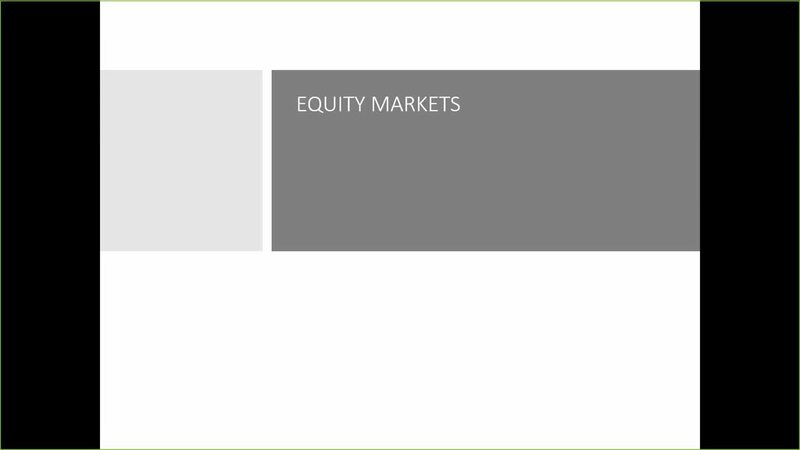 As you may know from other FEG presentations, we like to look at valuation fundamentals and sentiment and monitoring market conditions. And let's start with the fundamentals. Specifically what we believe to be the biggest driver of market returns since the great financial crisis back in 2008. What you see on this chart is the blue line, which is the growth of the global central bank balance sheets from roughly $5 trillion in 2009 to $15 trillion in 2018 overlaid by the return of the S&P 500 over this same time frame. these lines move in tandem with each other and we believe that's not a surprise. The amount of liquidity injected into the financial system through the expansion of banks' balance sheets has driven market returns throughout this period. And we expect that potentially to continue. You see in 2018, for the first time really since 2015 where we had a small decline in these balance sheets, there was an attempt at normalization of policy. The US market maintained a solid year through some of this reduction in balance sheet because of large fiscal stimulus that helped increase profit margins. However, the rest of the world, as you recall, in 2018 struggled mightily when we saw this liquidity dry up. While the S&P 500 corrected and it appears like it reacted to this reduction in liquidity, and that's what we saw in the fourth quarter. What's happened since then? And what's the outlook? Well, that all depends on what Jerome Powell says next. All of this reminds us a lot of the 2007 time frame when Chuck Prince made the famous quote about if the music's playing, you have to dance. We believe somewhere between September of '18 and January of '19 Jerome Powell may have taken a few piano lessons because the music seems to be playing again in the market stats. And so we have to keep our eye on this situation. If we believe we will see monetary tightening globally, we would expect markets to struggle. If we see what we saw even just this week from Jerome Powell and other central banks taking a dovish stance, markets could be poised to move higher. Now, what are the other factors that the market is contemplating around central bank policy? Well, if you go back to 2018, the fed was telling us to expect multiple rate hikes to the end of '18, two to four rate hikes in '19 with continued rate normalization. Fast forward to today, or technically earlier in January and you see that the market now expects zero rate hikes in 2019 and the beginning of rate cuts in 2020. The fed is still out there pointing to a couple of increases in rates via their dot plot, but the market has discounted that and was expecting a dovish fed. That in large part probably explained some of the bounce we've seen over the beginning of 2019. But if you look at this chart, these expectations started declining into a rate cut territory in late '18. That was largely due to the market's expectation that we were likely heading to a recession earlier than expected. So this information will be monitored. It's giving us insight into the market expectation for the economy which is weak, which is soft looking out into 2020. And it's also giving us the insight into fed policy and the market's expectations around fed policy. We are also clearly looking at all of the wall of worry that the market has climbed in January and oftentimes happens. This is information on economic uncertainty in the market. Clearly right now what we see is government shut down, trade wars, hawkish fed and White House volatility increasing the market's perception of economic uncertainty. That's fine. It gives us a little insight into the investor's sentiment. But maybe more importantly, it can portent weakness in the economy. If this economic uncertainty works its way into corporate decision making, if corporations are concerned about these economic policies, they could reduce spending, reduce spending, reduce cap ex, could result in more economic weakness than we expect. Investors have been buoyed by fed policy. Corporations and those making decisions on the real economy, we're not so sure. Moving on to consumer competence. we've seen a dramatic decline in consumer competence. This, by the way, is information on expectations. So this is not measuring the current state of competence, but the future expectations of consumers and it's declined rapidly late '18 into 2019. That's showing and that's proven through. And what we've seen is some of the volatility within the equity markets, competence waned. In late '18, we saw a sell off. Confidence may be returning in '19, clearly the market looks like that. However, throughout this period of January we've still seen the average investor, if you watch mutual fund flows, reduced their holding to mutual funds, increasing their bond holdings. So it appears that the consumer, the average investor is still not participating much in these markets. Let's take a look at corporate profitability. Another fundamental input into our analysis of the market and the outlook. What we've seen is a dramatic increase in corporate profitability in 2018. I think we all know why this was. We had fiscal stimulus. We had tax policy that pumped about a trillion dollars plus into corporate profits, increasing profit margins by up to 30% into the fourth quarter. For the year though, margins increased by about 23%. Which is fabulous margin growth, but only 10% of that 23 was organic corporate growth. The rest of it was the tax stimulus plan. Experts are predicting that corporate profit growth will decline in 2019 to 6%, but that is still 6% positive growth. 6% positive growth is a fine number when you look at history and when you look at the state of demographics in the United States. We could be happy with that. The decline is always though worth watching. As you look at these past periods pre-recession, corporate profits declined and declined significantly going into those recessions. Some of that was policy driven but it was also economic driven and sentiment driven. So we'll keep our eye on this as corporate earnings growth at the end of the day should be a primary component in the market return as well as the economic outlook. Let's finish with the other big risks that's on the table. Constant headlines about tariff situation between the US and China. Well going back in time, you go look at 2018, we presented multiple times that the tariff situation was dwarfed by the fiscal stimulus we saw from tax plans. Right now that's not the case looking forward in 2019. We have very little fiscal stimulus on the table. Less than $120 billion, sorry, just over $120 billion of stimulus while we're facing the potential of $250 billion of negative effect on the economy if the tariff situation worsens and turns into a trade war. This is a very significant drag and has to be factored into economic expectations, consumer sentiment and our outlook for the market. The headlines change every day. We hope to see resolution in this situation. If it's resolved, we continue to have an open government and we continue to have a dovish fed, things look fairly positive for the market in the short to mid term. These are the big picture issues that we're watching. My colleague Greg Dowling, will spend time talking about what we see within asset classes. There's always opportunities to take advantage of and he'll explain some of those to you. All right, well thank you very much Alan. I'm going to spend more time on valuations and long-term outlook. However, as Alan said, how we get there, especially in the short term, is going to be more driven by geopolitics, central bank policy and consumer sentiment. I will go across our different asset categories and provide some very high level comments on global equities, both public and private, fixed income, real assets and diversifying strategies. And we're going to start out with everybody's biggest allocation and biggest risk which is equities. So what we did here is we took equity valuation, so we use the S&P, we have emerging markets and we have developed international. And there's a lot of different lenses in which you can view valuation. Here we took four. So we took a five year old normalized price earnings. We took price to book, price to sales and price to cash flow. Did an equal weighting and this is what you get. If you played around with the different metrics or different weights, you roughly get this same direction, maybe a little bit different magnitude, but we think this is a very fair way of looking at it. And what you come to is that US market, even after the fourth quarter sell off, remain slightly overvalued. And international markets, so XUS, are slightly attractive. Now, in that we tend to prefer emerging markets. And we prefer emerging markets because of the demographics, but also because of the longer term growth potential. The one knock on emerging markets is always their financial vulnerability. This is a different emerging markets. They tend to be much more healthier and in better shape than they've done, than they've been in the past. This is a chart from the IMF that just shows that with a few select countries over different time periods, and again these are, emerging markets are a lot of different countries that don't necessarily share anything in common other than they tend to be emerging. So not all are better, but the majority of them are much better than they were sort of in in the 90s where we had a very large emerging markets crisis. So we definitely prefer EM. Having said that, this is not for the faint of heart. Emerging markets have provided higher returns with much, much higher volatility. And we think in the short term that's going to be driven by trade war, especially the China US relationship. And on currencies, and specifically the US dollar and the strength of it. So with public equities largely being fully valued, fully valued being the US little overvalued and international little undervalued, where do you get return? And one area where we do believe you can find some excess return is in private equity. In private equity you have to be careful. We are not the only folks who have this view. And if you look at fundraising by vintage year, both in venture and buy out, the 2016, '17 and '18 years are elevated and they're approaching the 2007 and 2008 period. So we've got to be very careful with manager selection. One thing that we can potentially do, and we think investors should consider, is where possible skewing smaller. So the next chart is a chart of the spread between top and bottom core tile on the buy out side. And if you can go small, and small being defined here as those funds below $500 million, you can earn a premium over a large and mega. But again there is a lot of capital being raised here. We do think you're going to earn excess returns, but our overall projection of what those returns are are lower than they once were. And this is pretty well captured here in this chart where it shows the private equity performance spread and that tends to follow the overall value discount between public and private and it still exists. It's still positive, although it has trended down more recently. On the fixed income side, we're going to talk about a liquidity barbell. And so kind of playing a close to the vest on the liquid side and maybe taking a little bit more risk on the private side. And so if we look at rates and here, this is the tenure, it's been in a long downward trend since the early 80s. But within that trend there's a lot of volatility. But it seems to bounce around between one and two sigmas around the mean. And we hit that two sigma ceiling in 2018. We think that's probably a pretty good rate and a pretty good estimate of what your return is going going to be. We'll take that yield and the defensive nature that it provides with all of the different concerns that Alan spoke about earlier. On the credit side, and there is a myriad of charts we could show, this is a chart showing the degradation of quality among all credit instruments. And this here is investment grade. In investment grade, you can see that most of the issuance in 2018 versus a decade ago in 2007 has been more on the lower quality, so the triple B side. But if you look at high yield or you looked at loans, it would be the same story. And then if you talk about investor protections, covenants, anything, those are much, much lower. And they're doing that to get a little bit more of a yield pickup. We're just not so sure that it's worth the risk, although watching it very, very closely because this may plant the seeds for some opportunities a little later on. So what do you do? Similar to what we talked about on the private equity side, we're going to look at private debt. And private debt still offers a returning yield of over 10% and a illiquidity premium over high yield of above 4%. So we still think that looks pretty favorable. But again, we're not the only market participants and figure this out. And as more money has come into this space, you have seen the returns compress from almost 15% in 2018 to call it 11, 12 percent now. So that has pushed down, pushed down yield. Here manager selection is also very important. So we're going to look at managers that have been around for awhile, so no newcomers and potentially look for those that also have some workout experience. But we think that's the right play here in the fixed income space. Moving to real assets. When we speak broadly about real assets, most things are fairly valued. There are some pockets of opportunity here and there, but the one exception for us really is energy. And so we're going to highlight some opportunities in energy and really specifically MLPs. The energy markets have been extremely volatile. We've gone through several years of volatility and it happened again late last year where energy prices fell off a cliff. And with all of that volatility, we see a disconnect between energy prices and many of the public securities and public companies that have a energy component to them. And so this could be a publicly traded EMP stocks, it could be a lot of things, but here we're highlighting MLPs, master limited partnerships. This is really the infrastructure that are the toll roads. They get oil from the well to its distribution. And this is something that is crucial in America as we've become one of the world's leaders in energy production. And in those areas where there's energy production, we just do not have the infrastructure. These have sold off due to energy prices. Last year we also had some very confusing rulings from a government organization, a first. We also had a process where many of these MLPs had some truly awful governance and they've slowly started to work through this. And so what we have now are yields that are above 8%. We have very attractive valuations, improving governance, improving prices, and we think MLPs could be a real big winner over the next couple of years. So this we think this is one of the better and more attractive areas for investors. Lastly, we're going to go to diversifying strategies. And for those of you who are familiar with FEG, you'll know what diversified strategies are. For those of you who are not, this is really what we call most of our non directional hedge funds. Some people might call this absolute return hedge funds, although I think that's a little bit misleading. DS, diversifying strategies or hedge funds have been the target of a lot of negative press and rightfully so. They have underperformed with higher level of fees for almost 10 years. But there's good reason why they've underperformed. It's not been the right environment for them. There's not been much volatility. Hedging hasn't helped in a market that has gone straight up. They haven't been able to earn much of a rebate with rates being low and there's not been much dispersion. As we've moved past that period and we've become much more late cycle, we've seen the return of volatility and with that we've also seen a rationalization of hedge fund pricing and a lot of assets leave the space. So we are constructive over the longer term on diversifying strategies, especially the role in the portfolio as offering ballast when many things tend to be overvalued. Couple areas where we'd highlight are event driven. Here we're showing a MNA activity and you can see that we've seen a real good increase in the number of deal count. Now this is very sporadic and it's certainly been in the short term impacted by government shutdown, Brexit, some of the trade issues. But being late cycle as companies are looking for more and more growth, have strong currency in their stock, we tend to see a lot of deal activity. And it can also be spin offs or split offs. A lot of things going on in the space. This is a great area for hedge funds and with all of the noise going around, there should be some pretty attractive spreads. So that's one area we'd highlight. The last area we'd highlight in the hedge fund space is macro. And this is another area that's been very tough. And it's partially been taught because of the central banks, the massive amounts of liquidity that they pumped into the space, but also how they've synchronized many of their rate cuts or rate rises. Now as we get further along, you're seeing people making a lot of different moves, some raising rates, some cutting rates. We're seeing economies grow at different levels, a lot of independent thought and confusion. And so when we have that, we have a great opportunity to take advantage of that and you really need volatility, rate volatility, currency volatility and we think that the seeds are planted for that. But if you're going to be a good macro manager in this day and age, you've got to look past the G3, G7. You also have to include merging markets. So those managers that have the ability to trade all markets should be able to add some performance from the volatility that we're seeing. And so in summary, we have a very fully valued market which makes sense having a very, very long and slow recovery. On the equity side markets are fairly valued, so we would look for where people have the ability to be a little bit more illiquid and have the opportunity for good managers selection and to lean into private equity a little bit. On the fixed income side, we're going to play fixed. We're going to be a little bit more geared towards core and taking more interest rate risks. And marrying that up, or taking credit risk on the private debt side. Real assets, we're going remain diversified, but where we might stick our nose out a little bit will be with MLPs. We think there are attractive returns. And don't forget about hedge funds. They can provide a pretty good balance if there is a more risk to come. Great, and we'll finish with a quick snapshot of where we believe we are in the economic cycle in the United States. Many of our clients ask us what we think about the economy and the outlook for the economy. This is a risk monitor that we've built to help explain to our clients where we are and how close we might be to end of cycle or the next potential recession. Clearly, this is a hot topic right now where the market is reacting to potentially higher recession expectations with significant volatility. In our eyes as we review all the major factors and data points that lead to recessions, we have a low near term risk. However, and near term being zero to one year out. However you look longer out in a one to three year time frame, most of these indicators are flashing some warning signals. So we have to be very cognizant of risk right now across our portfolios. We hope you enjoyed the opportunity to hear our views, our opinions on the market. If you have any questions, please feel free to reach out directly to me, to Greg or any other FEG representative that you're in contact with. We look forward to answering those questions. Thank you.